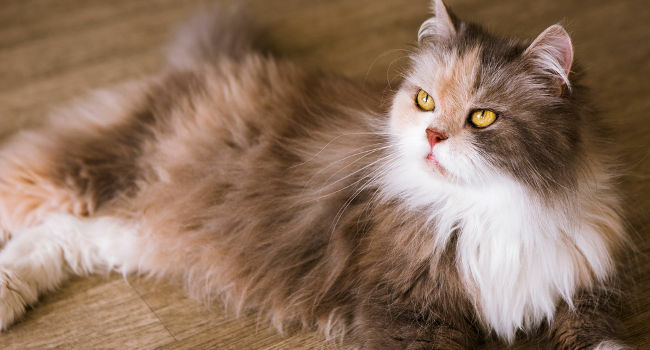 It's natural for your cat to go through cycles where they shed their dead hair once or twice a year, and it's usually in the spring and early fall months. However, constant shedding could be a clue that your cat isn't getting everything they need in their diets because you shouldn't be able to get handfuls of hair every time you pet them. The problem could be your cat's diet, and we've picked the five best cat food for shedding options available. But, we're going to go over a short guide before we get to our top five picks that will help you understand why your cat sheds, what to look for in their food, and more. Cats shed once or twice a year to help remove the dead hair from their coat and make room for the new hair that grows in. If it's in the spring, your cat will get a lighter coat to combat the heat. If it's in the winter, a thick coat will grow in to keep your cat warm. But, your cat can also shed more than normal if they have hormonal imbalances, internal parasites, an unbalanced diet, allergies, fleas, dry skin, poor grooming habits, or if they're pregnant or lactating. There are several ways that you can tell if your cat is going through a routine shedding or if there is something wrong. Normal shedding is one or two times a year when you notice that there is more hair coming out of your cat's coat. This is usually around the same time each year, and it should start to go away after a few weeks because your cat will have removed their old coat for the new one to finish coming in. Shedding year round, constant licking, constant biting, hair loss, and a patchy or dull coat are all signs that your cat isn't on a normal shedding schedule. The first thing that you want to do is get in touch with your veterinarian because they can tell you if there is something wrong with your cat and start a treatment plan. Bathing - If your cat will tolerate it, give them a bath every two or three weeks to help remove any dirt, dead hair, snarls, and debris that may get caught in your cat's coat. You can also wipe them down with a wet wipe and spray in some leave-in conditioner to moisturize their coat and avoid a full bath. Brushing - You want to dedicated a few minutes each day to really brushing your cat's coat out to help remove the dead undercoat and reduce the shedding. Use wire-bristle brushes for cats with longer coats, brushes with soft bristles or combs for medium or short-coated cats, and grooming gloves to pull any top layer hair. Supplements - You can give your cat supplements with fatty acids that help to improve your cat's skin and coat health and reduce shedding and hairballs. You can buy these supplements from many pet supply stores, online, or from your veterinarian's office. There are several ingredients that you want to see in your cat's food, and there are several ingredients that you want to avoid. This can help to ensure that you get a portion of healthy and balanced food for your cat to eat. Many cats have allergies or intolerances to common ingredients in cat food like wheat, grains, soy, gluten, or even certain protein sources can create an impact on your cat's coat health and cause them to shed. You may want to try a limited ingredient diet that removes most of these allergens. Also, try a more novel protein source like bison, venison, or lamb. Believe it or not, your cat doesn't care what their food looks like, and adding artificial flavors, colors, or preservativesare purely so their humans will buy a certain brand over another. They offer no nutritional value for your cat, and it's best to avoid foods that contain these things all together for a healthier formula. Unfortunately, your budget is going to play a role in which food you buy for your cat since it can get expensive the more natural you go. The key is to read the label of different cat food brands and find one that doesn't contain things like meat by-products, meat or plant meals, or one that doesn't have meat listed as the first few ingredients. Omega fatty acids are the things that help to improve and maintain your cat's skin, and coat health, one popular source of these fatty acids is fish oil. You want to pick out a food that has a higher Omega fatty acid content, and they should be very clearly marked on the label. The protein in your cat's food should come from a lean source like lamb, chicken, bison, salmon, whitefish, or even beef. No matter what the protein source is, it should be the first ingredient on the label. If not, you want to see it within the first three ingredients because the first three ingredients are what make up the bulk of your cat's food. As with all things, quality really does matter. Your cat food should come with quality ingredients sourced from trusted places. Look for a cat food that has clearly market protein, fruits, vegetables, and whole grains because they're typically easier on your cat's system when they try to digest it. 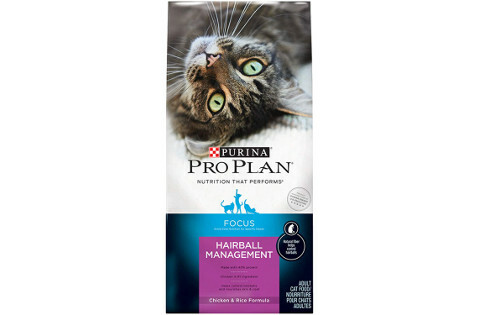 Purina's hairball control food comes in three different sizes ranging from just under four pounds up to 16 pounds that allows you to try a smaller bag to see if it works on your cat. The first ingredient on the package is real chicken for a lean protein source. This food comes loaded with natural fiber that helps to minimize and reduce the occurrence of hairballs in both long and short haired cats. It also comes with essential nutrients, vitamins, and minerals that ensure your cat's skin and coat are healthy throughout their lives. The lean protein source is supported by whole grains, fruits, and vegetables that help to make up a balanced meal for your cat each time they eat it. Your cat will get smaller kibble pieces that come in a variety of shapes that make it fast and easy for your cat to pick up and eat. Cat parents who bought this food to help control their cat's shedding liked that it came with a higher amount of vitamins and nutrients that help to keep their cat's skin and coat healthy. Cat parents did say that this hairball control food was slightly more expensive. 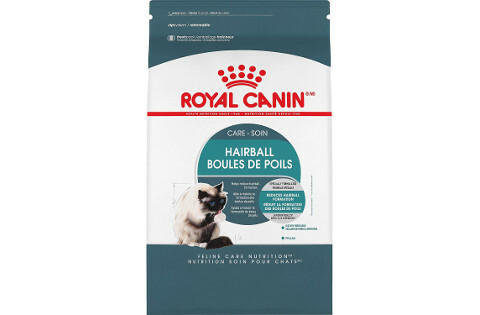 Royal Canin's cat food comes in three sizes that allows you to pick the one to suit your cat's size and eating habits, and it's tailored to cats a year older and up to improve their coat health and reduce hairballs. It contains an exclusive blend of fatty acids that help to improve your cat's skin healthy and their coat health to give you nourished skin and a sleek and healthy coat. It also comes with a blend of dietary fiber that moves hair through your cat's digestive system to prevent it from building up. It has a triangular kibble that comes formulated to fit your cat's mouth, and it's also easier for your cat to grasp, pick up, and eat. You can feed this food as a standalone dietary choice to ensure that your cat gets a healthy and balanced meal each time they eat it. Cat parents who bought Royal Canin's food were happy that the kibble was specially designed and formulated for their cat's mouths to make it easy for them to pick up. Cat parents did point out that this food is slightly harder, and this may make it difficult for older cats to eat it. 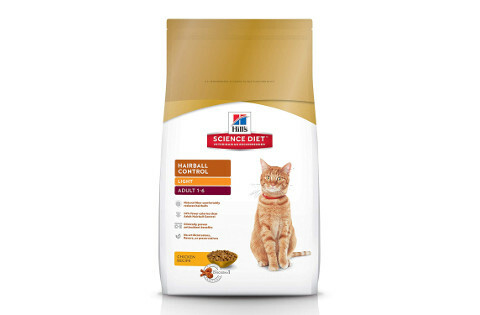 This version of Hill's Science Diet is specially targeted toward cats that have issues with their skin and coat, hairballs, and weight management. It has up to 14-percent fewer calories per serving that other formulas, and this can help your cat maintain a healthy weight. This food's formula comes from natural ingredients that include a higher amino acid content, fatty acid content, vitamins, minerals, and antioxidants that help to support your cat internally and externally. There are no artificial flavors, colors, or preservatives for a healthier choice for your cat. The blend of antioxidants help to repair any damage your cat's skin or coat may have that can lead to shedding, and it starts working on a cellular level before branching out. There are whole grains, fruit, and vegetables in addition to the chicken for a balanced and healthy meal. Cat parents who bought Hill's Science Diet liked that it had a higher antioxidant content paired with a formula that had fewer calories for weight management. Cat parents did say that this food was extremely dry and unappealing to their more picky cats. This cat food comes with real and deboned chicken as the first ingredient for a lean protein source, and it also features fruits and vegetables to help balance the formula out. You cat will get a higher natural fiber content that can help to ease hairballs. This food comes with LifeSouce Bits added to the formula, and these LifeSource Bits come packed with antioxidants, vitamins, and minerals to help give your cat's system a boost and improve their skin and coat health. There is no corn, by-product meals, wheat, or soy in this formula to make it healthier. The kibble comes in several different shapes that make it interesting and easy for your cat to eat at each meal. Finally, this food supports a healthy oxidative balance, immune health, digestive health, and all life stages. 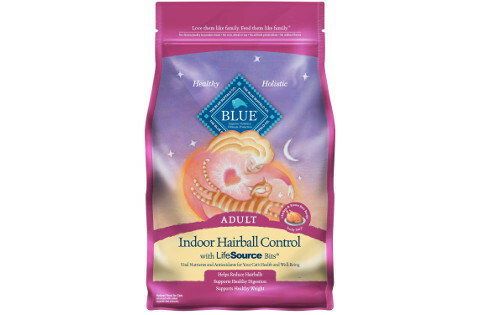 Cat parents who bought Blue Buffalo's food for their cat liked that it contained LifeSource Bits for an additional boost for their cat's system. Cat parents did mention that this food seemed to be a little greasier than other choices, and it left a residue on their cat's bowls. This shedding control cat food comes with a 40-percent protein content with a lean protein source listed on the label as the first ingredient. It's also packed with fatty acids to help improve and maintain your cat's skin and coat health to reduce shedding and hairballs. The smaller kibble pieces make it easier for your cat to pick up and eat, and the kibble's smell is designed to attract cats to it. You can pick from three different bag sizes, and this makes it easy to start with a smaller bag to transition your cat over before you order a larger one. It features natural chicory root for the fiber content, and this helps to ensure that your cat's digestive system stays regular and doesn't allow for hairball buildup. The vitamin and mineral content work to balance your cat's system and promote both internal and external health. Cat parents who purchased Purina Pro Plan's formula for their cats liked that it has a higher protein content combined with fatty acids to promote your cat's health. Cat parents did say that this food could take a couple of weeks to start working properly. What's the Best Cat Food for Shedding? 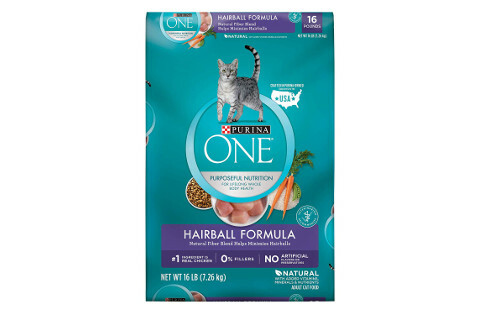 Our pick for the top cat food for shedding is Purina ONE Hairball Formula because the manufacturer packs it full of healthy dietary fiber to keep your cat's system regular. It also has an excellent balance of protein, fruits, vegetables, and whole grains for a balanced meal choice. We also liked that the higher amount of nutrients and vitamins helped to restore our cat's skin and coat health to help control shedding. Finally, the kibble came in several shapes that are easy for our cats to pick up and eat.